Combination pliers Comfort grip handles 200mm ..
Long Nose Pliers Comfort grip handles 150mm ..
Side Cutting Nippers Comfort grip handles 150mm ..
End Cutting Nippers Comfort grip handles 200mm ..
Water Pump Pliers Comfort grip handles 250mm ..
Thumbturn Pipe Wrench 175mm All-purpose steel wrench grips the workpiece tighter when additiona..
All purpose steel wrench grips the workpiece tighter when additional pressure is asserted. Knur.. This thumburn pipe wrench is an all purpose wrench that grips the work piece tighter when additio..
150mm Adjustable Spanner Curved handle for extra grip Traditional blacked finish Non-slip g..
200mm Adjustable Spanner Curved handle for extra grip Traditional blacked finish Non-slip g..
250mm Adjustable Spanner Curved handle for extra grip Traditional blacked finish Non-slip g..
300mm Adjustable Spanner Curved handle for extra grip Traditional blacked finish Non-slip g.. Pipe Wrench 300mm Traditional pattern pipe wrench Drop forged handle and jaw Fully hardened.. Tradition pattern pipe wrench Drop forged handle and jaw Fully hardened and tempered for long..
Open and bi-hexagonal ends with 15 degree offset for greater access. 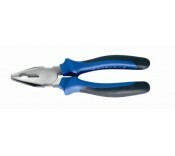 Hardened and tempered, dro..
Knipex End Cutting Pliers 200mm Ideal for twisting and cutting wire in one operation. Manufac..
Nickel-plated Steel, self-locking pliers Easy screw adjustment for controlled grip Quick rele..
Hardened steel Whitworth scaffold spanner with swivel head For older-style scaffold fittings ..